Travel State Route 120 west from Lock Haven towards Renovo for approximately seven miles. Eagleton Road will be on your left. Turn onto Eagleton Road and travel up over the mountain for approximately 2.5 miles to a point where the Eagleton Road is crossed by a power line. Park there. The looping trail is open to foot traffic, bikes and horses. This trail, named for the mining village of Eagleton, existed in the area from about 1845 to 1870, when the Eagleton Railroad climbed the Tangascootac Valley to the village on the plateau. The climb was made on a series of switchbacks called the "Seven Switches." Parts of this trail follow the old railroad grade. 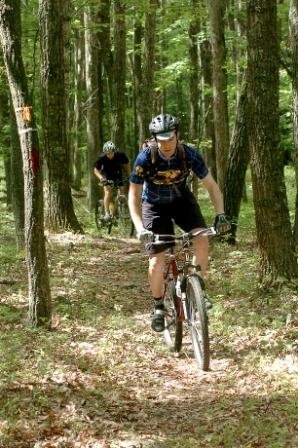 The trial provides loops that offer rides of 20 or more miles. Cycling is challenging, with many narrow, steep and rocky sections.